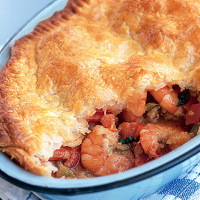 In The Carpenters' 1973 cover of this ballad, Karen’s voice glides over 'jambalaya', 'crawfish pie' and 'filé gumbo'. Preheat the oven to 200°C/gas 6. Melt the butter in a large frying pan and add the onion, red pepper and celery. Season and shake in some Tabasco. Cook the mixture for around 6 minutes until soft. Add the tomato, seafood and parsley; cook for 4 minutes, stirring. Whisk the flour into 2 tbsp water and add to the pan with 200ml water. Stir for 2 minutes until thickened; cool. Use half the pastry to line a 22.5cm pie dish. Spoon in the cooled mixture and brush the pastry edge with the egg. Use the remaining pastry to make a lid; crimp the edges together. Brush with egg. Bake for 35 minutes. Try a Californian chardonnay with the pie.